“Everyone has a story to tell. Harness the power of maps to tell yours” is ESRI Story Maps tagline. It encompasses our motivation for organizing an event on science communication last semester, Storytelling with Story Maps. 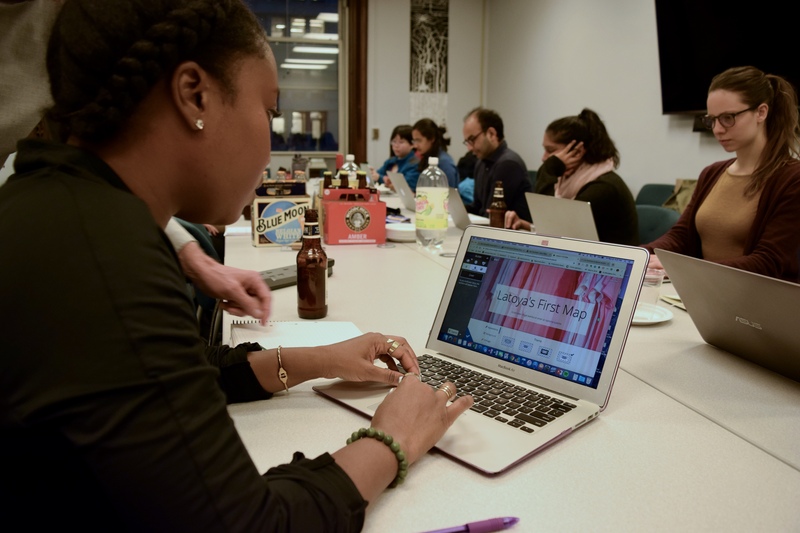 With a grant from the Center for Science and Society and additional support from the Department of Ecology, Evolution, and Environmental Biology Department (E3B), we brought the power of storytelling with Story Maps to Columbia University graduate students. The aim of Storytelling with Story Maps was to introduce an innovative medium to share scientific research with a wide audience. Story Maps is a web-based platform that can be used to tell captivating stories using Geographic Information System (GIS) data. GIS is a commonly used tool for the environmental sciences, as well as a multitude of other disciplines. 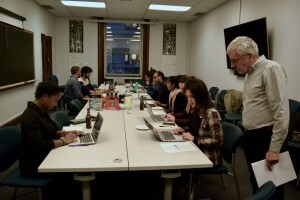 We invited Allen Carroll, the founder of ESRI Story Maps, and a cartography enthusiast who served as National Geographic Society’s Chief Cartographer for 27 years. 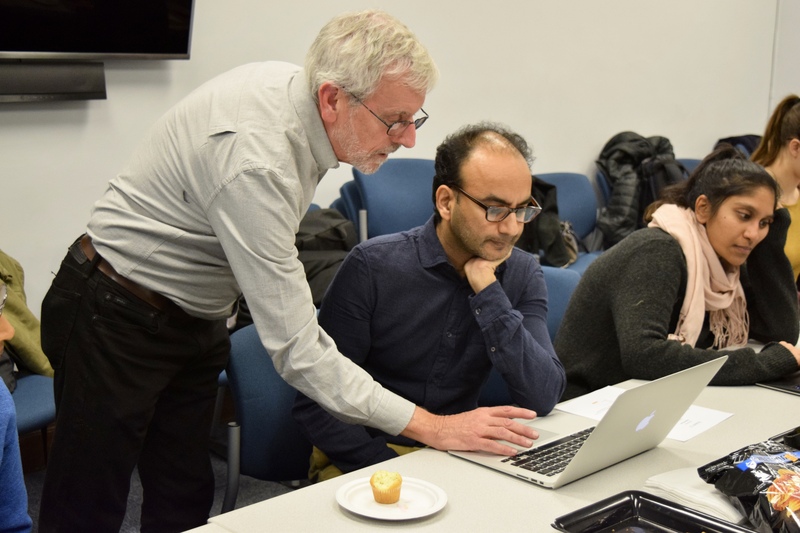 Our event consisted of a talk on the different styles of science communication using Story Maps, followed by a workshop for a hands-on introduction to the online platform. At the end of the night, each person left with the beginning of their own Story Map to communicate their research. A memorable moment from the workshop was when the room went from silent concentration, as each student constructed their own Story Map, to a loud collective gasp. A crowd of workshop participants had gathered around Jazlynn Hall, a PhD student in the E3B department, to watch her animation of forest regrowth in Puerto Rico over the last few decades. 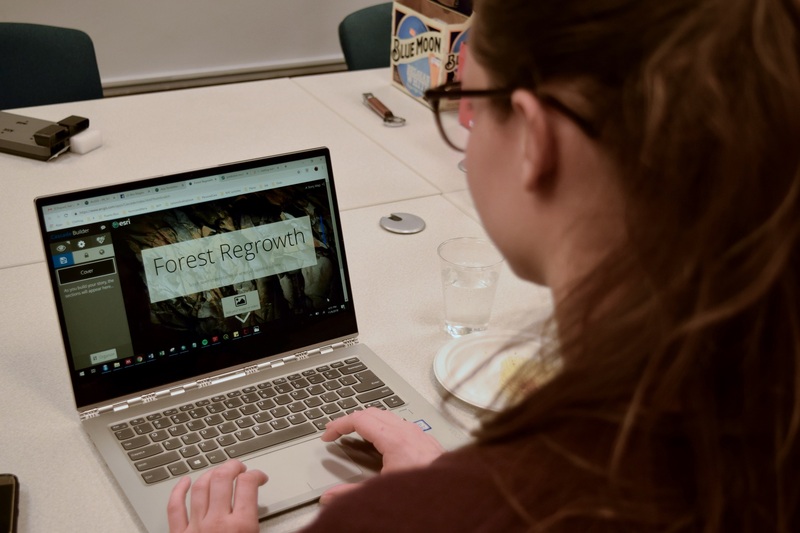 Jazlynn previously created maps of forest growth, she organized , and she organized them chronologically in her Story Map to allow the reader to interact with her maps of forest cover change. She said, “I still hadn’t seen the final result by the time everyone was near my desk watching the story I had put together, so I was pretty blown away by the effects as they happened! I would love to put together a Story Map once I get my research story a little more polished and have a clearer message.” Seeing our work displayed in this manner makes us realize the potential of a powerful visual, like Jazlynn’s animated maps on forest regrowth over time. If you thought this was the end of the story, think again! Storytelling with Story Maps was the first of four events that aim to advance methods and communications skills for broader scientific impact. 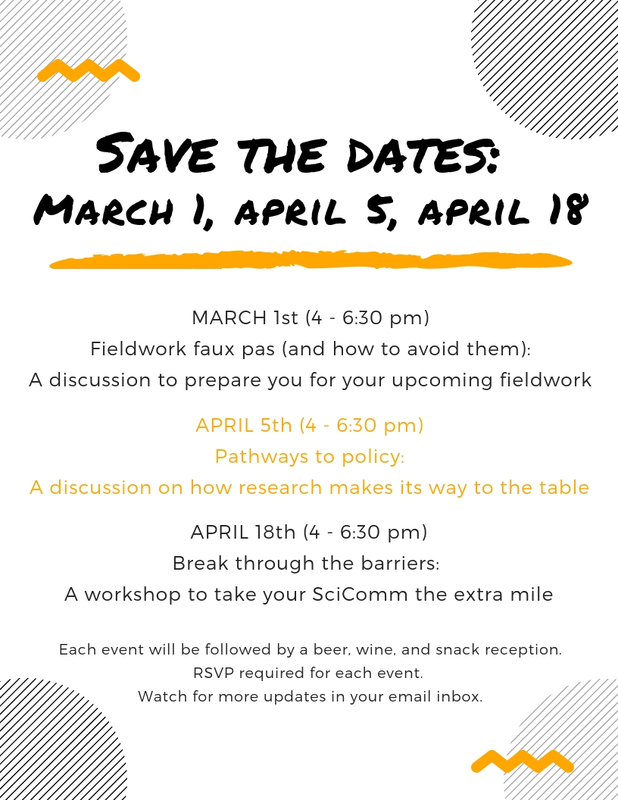 This event series continues into spring 2019 and aims to train E3B (and other departments) students in communications and skills that broaden the impact of their scientific research. 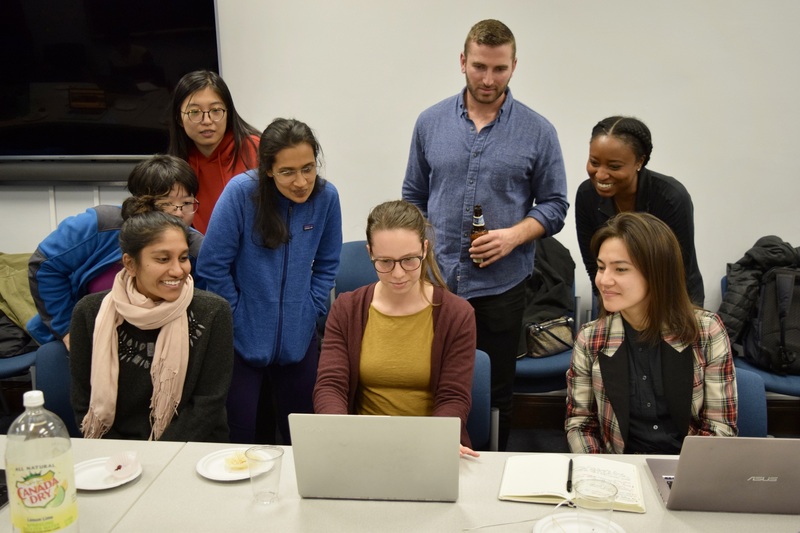 Students from multiple disciplines whose work intersects science and society will meet at our events to promote interdisciplinary, intellectual discourse between Columbia University graduate students. We have 3 more events coming up this semester. Participation is limited, so save the dates and keep an eye out for updates! 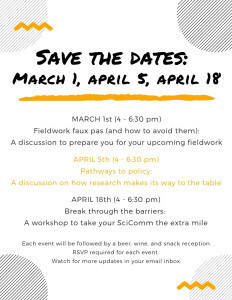 With speakers from various organizations and schools such as the Wildlife Conservation Society (WCS), International Union for Conservation of Nature and Natural Resources (IUCN), Columbia University’s Digital Storytelling Lab, Princeton University and others, you don’t want to miss an opportunity to learn from the best!